Congratulations to "Jennifer D.", the winner in Maria Elena's giveaway. Thank you to all who participated! The cost of this coin might just be too high... 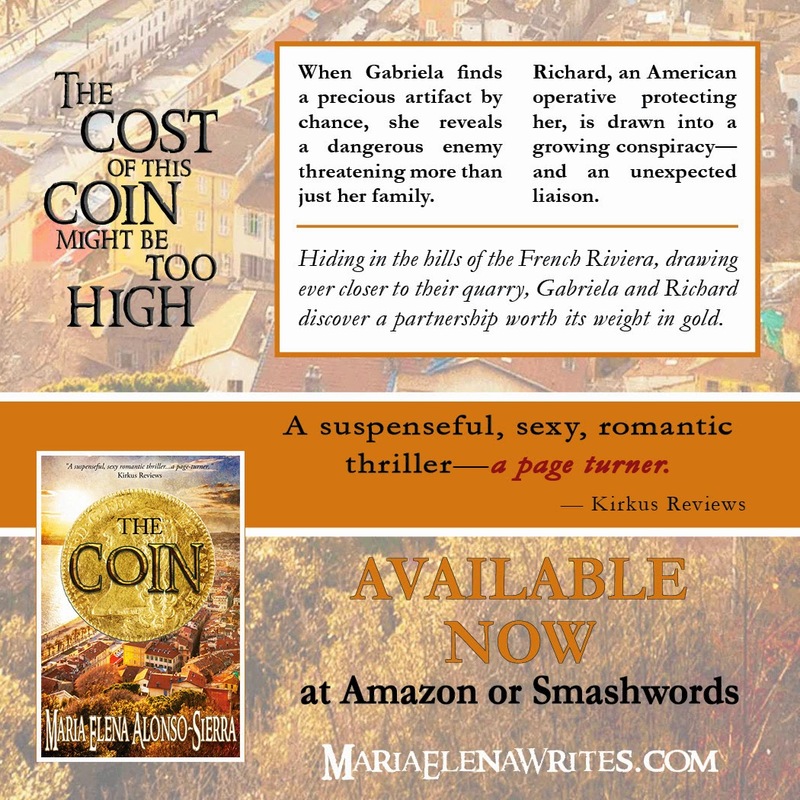 When Gabriela finds a mysterious coin in the French Riviera, she is thrust into a struggle between governments, terrorists, and madmen, all seeking vital information she doesn't know she has. Richard, the intelligence officer assigned to protect her, has all he can do to keep her safe--and keep the stirrings of his heart from endangering them both. Richard carefully disengaged her arms. “Sweetheart, I have to assess any damage.” His voice was soft, husky, as if he were experiencing difficulty with it. Gabriela finally let go. She tried to swallow, but her mouth was dry and her body couldn’t stop shaking. Seconds ago, this building had felt pleasantly cool. Now, it felt like an icebox. Her throat constricted and she tried to hold back tears. She never thought she could feel this frightened. “I’m fine,” he said, but didn’t look up from his gentle examination of her. If he did, he was afraid she would read the horror in his eyes, the anger, and his vulnerability. He had been prepared for anything—but this? Richard concentrated on cataloging her injuries. This had been too damn close. Gabriela sensed that, despite his words, all was not well with him. Richard’s hands were shaking slightly. His tight discipline seemed to be fraying like a spider’s web against buffeting winds. She had once scoffed at the idea of Richard ever losing control, but now she was aware he was human, not a superhero of comic strip proportions. He could be hurt, and had been, trying to protect her. The back of his shirt sported burnt patches where hot metal had struck him as he’d shielded her body after the blast. Her simple confession destroyed the final barrier that had caged him away from her. His thumbs shifted to her lips, felt the slight tremors there. With a hunger so fierce it practically drowned him, he brought her face to his and kissed her, softly at first, wanting to taste her, to absorb her tremors. When she opened her lips to him in welcome, he dived in, drinking deeply, longingly, wanting to fuse with her. “No.” She got up abruptly. She knew what Richard wanted to say, but she couldn’t allow it. Things that were said could never be taken back. Maria Elena Alonso-Sierra is a full-time novelist based in North Carolina. With Cuban roots, she has lived in many countries, including France, the setting for her first novel, The Coin. She speaks English, Spanish, French, Italian, and German, and reads Latin, Middle English, and old French. She holds a Masters in English literature, specializing in medieval romances, and is currently an active member of the Carolina Romance Writers. She loves to hear from her readers, and always hopes to open a dialogue with her fans. 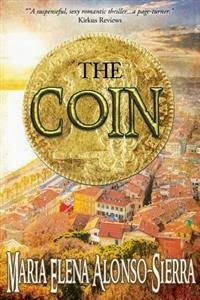 Signed print copy OR “Authorgraphed” Kindle version OR epub version of The Coin along with a bookmark and rack card. Giveaway ends 11:59pm EST November 29th. Please supply your email in the post. You may use spaces or full text for security. (ex. jsmith at gmail dot com) If you do not wish to supply your email, or have trouble posting, please email maureen@justromanticsuspense.com with a subject title of JRS GIVEAWAY to be entered in the current giveaway. Thank you for hosting me, Maureen! I am honored. I'm loving the idea of this "mysterious coin". Sounds fabulous. p.s. : One of my best friends and neighbors is a woman named Mariaelena with the two names put together as one. What a coincidence! :-) I like the name. Romantic suspense has always been my favorite, as well, Janice. That is why I decided to write something I would like to read myself. I'm glad you like it. And, wow, it is a coincidence about your neighbor. Oh wow, this sounds awesome!! Just the kind of story I like to read. Great excerpt! Thanks, Brooke. I enjoyed writing it. Thanks, jaclynlavigne@yahoo. Extra thanks go to Maureen for giving me the opportunity to visit and share.